With most teams having played five games in the 2017 NFL season, only one is undefeated and three others have four wins. Three teams are without a victory, and no first-place team even has a two-game lead in their division. After finishing in last place in 2016, the Eagles are the clear favorites to win the division. Not only does Philadelphia sit atop the NFC East, but they are tied with the undefeated Chiefs with the biggest division lead of any first-place team. Philadelphia was absolutely dominant in their 34-7 win over Arizona Sunday. Carson Wentz completed 21 of 30 passes for 304 yards and four touchdowns. He’s now the NFL’s ninth-rated passer, and the Eagles are a legitimate Super Bowl contender if Wentz can perform like a top-10 quarterback. Philadelphia has the NFL’s second-ranked run defense, and they continue to put pressure on opposing quarterbacks. Their secondary remains vulnerable, though the team’s front seven is good enough to make up for their biggest weakness. The Eagles only have to worry about the Cowboys and Redskins since the Giants’ season is long over. Dallas suffered a big loss to Green Bay to drop them below .500, and Philadelphia has a major advantage over the Redskins, having already won in Washington. The Giants, Browns and 49ers are the NFL’s remaining winless teams. Kyle Shanahan isn’t in jeopardy in his first season with San Francisco, but New York and Cleveland will be forced to make a change by the end of the season if things continue to go this poorly. The thought of McAdoo’s job being in jeopardy after he led the Giants to an 11-win season in his first year as the team’s head coach seemed impossible just a few weeks ago. That was before New York became the league’s biggest disappointment by a mile. Picked by some to reach the Super Bowl, the Giants are 0-5 and possibly headed for a winless first two months with games against the Broncos and Seahawks upcoming. New York could be making some big changes in the coming months, potentially taking their quarterback of the future with a top draft pick and getting a new head coach. Cleveland didn’t have nearly the same expectations as New York, but Jackson can only lose so many games before he’s fired. He’s 1-20 with the Browns, and the team just lost winnable games at home to the Jets and Bengals in consecutive weeks. DeShone Kizer doesn’t look like the answer at quarterback, and Jackson hasn’t proven to be the answer as the head coach. Thirteen years ago, Eli Manning, Philip Rivers and Ben Roethlisberger were all taken within the top 11 picks of the NFL Draft. With all three starting quarterbacks now in the top 10 in all-time passing yards, it seems clear that their best days are behind them. Rivers and Manning were equally mediocre Sunday as they went head-to-head at MetLife Stadium. Rivers ranks 22nd in passer rating a year after leading the NFL in interceptions. Manning can’t seem to have a good game if Odell Beckham Jr. doesn’t make spectacular plays, and New York’s offensive line isn’t helping matters. The Chargers and Giants are just about guaranteed to miss the playoffs, and their respective teams should have high selections in a quarterback-rich draft. Everything is pointing toward L.A. and New York preparing for life without their current franchise quarterbacks in the 2018 offseason. Roethlisberger isn’t in quite the same situation, starting for the favorites in the AFC North. He put up big numbers last year and was considered to be a top-10 quarterback at the start of the season. But his five-interception performance against the Jaguars in Week 5 highlighted what’s been a disappointing season for the two-time Super Bowl winner. Despite playing with arguably the NFL’s best running back, wide receiver and offensive line, Roethlisberger ranks 28th in passer rating. Eighteen teams are scoring more points per game than Pittsburgh. It didn’t seem possible, but if the NFL season ended after Week 5, Smith would be the easy MVP choice. He hasn’t simply been a “game manager” during Kansas City’s five-game winning streak. The quarterback has been the Chiefs’ best player, making big plays against good defenses. Smith leads the NFL with a 125.8 passer rating, ranking well ahead of Tom Brady. He’s the only starter completing more than 70 percent of his passes, and he’s thrown 11 touchdown passes and no interceptions. With Kareem Hunt struggling to run the ball effectively for the first time all year, Smith had arguably his best game of the season Sunday night, completing 29 of 37 passes for 324 yards and three scores. Even if Smith doesn’t continue to keep up this pace, he seems to have morphed into a quarterback that can lead Kansas City on a title run. 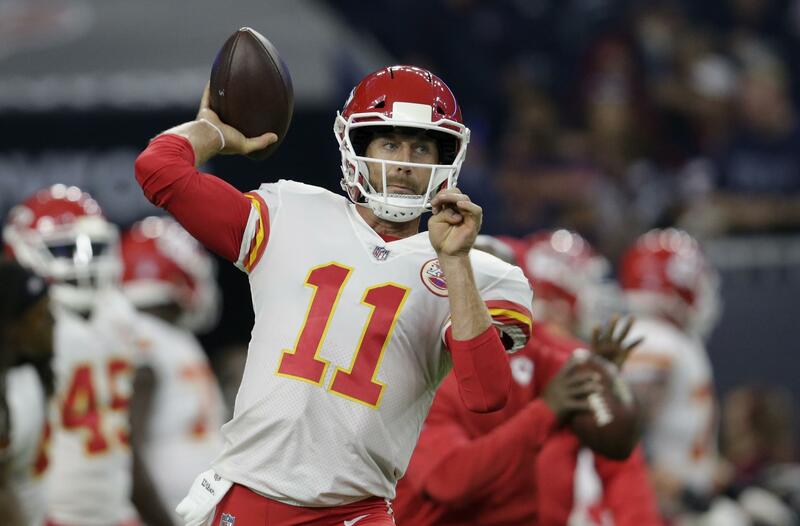 When the Chiefs traded up to take Patrick Mahomes in the draft, they seemingly admitted that Smith couldn’t win them a title. He certainly can do just that if he plays anywhere close to this level, unafraid to throw the ball down the field and utilize Kansas City’s dangerous weapons. Oakland and Tennessee were among the trendy picks to have big seasons in 2017. The Raiders received more Super Bowl bets than anyone in Las Vegas, and the Titans became the favorites to win the AFC South. Both teams, however, are in a precarious position with 2-3 records and their starting quarterbacks dealing with an injury. Oakland might be one of the AFC’s best teams when they are fully healthy, but their schedule could prevent them from making any kind of playoff run. The team still has two games left with Kansas City, as well as matchups with the Patriots, Broncos, and Eagles. Trailing both the Chiefs and Broncos in the AFC West, the Raiders better hope Derek Carr is good to go when they play the Chargers in Week 6 in a game they can’t afford to lose. Tennessee’s schedule is what should keep them alive to get a top-four playoff seed, though it might not matter much if Marcus Mariota misses any more games. The quarterback has suffered injuries in all three of his NFL seasons, and the Titans aren’t going anywhere with Matt Cassel under center. Jacksonville and Houston seemingly have just as good of a chance to win the division, which will likely only get one team in the playoffs. Tennessee also needs to prove they can stop good quarterbacks.